What we have here are two of the very great warhorses of 20th century ballet. A recent check of ArkivMusic.com indicates that there are currently 124 versions of Le Sacre in print and another 58 versions of L’Oiseau de Feu, the latter usually one of two versions sanctioned by the composer in his lifetime: the 1911 and the 1945. Since most listeners are familiar with both pieces, I’ll be brief and describe the salient features of these performances and avoid going into the history of the works. I should say first of all that this recording of The Rite of Spring is about as good as I’ve heard lately. Maestro Simonov extracts a very robust performance from the RPO that doesn’t miss a beat in this very difficult music. The recording ambience is superb - for both this and The Firebird - with a bias toward smoothing out some of the harsh edges other conductors chose to leave in; Boulez is one, the composer himself is another. What Simonov stresses here are the resonant basses — helped by the engineers — with a secondary focus on a certain atmospheric eeriness in the transitional movements. There is a difference, of course, with the size of the orchestra as well. A full orchestra can rarely fit into a performance pit for a ballet or opera, and The Rite of Spring really flourishes with the sound of a full orchestra. I’ve seen one good performance of the actual ballet, The Rite of Spring and two bad ones. The dancing was fine in all three. The physical sound was the victim. If you’re in the market for a starter-disc for a young person just getting acquainted with Stravinsky, I’d recommend this disc. Otherwise, you have to wade through the dozens and dozens on the market. I very much enjoyed this recording, which is also my first exposure to conductor Yuri Simonov and this label, Regis Records. 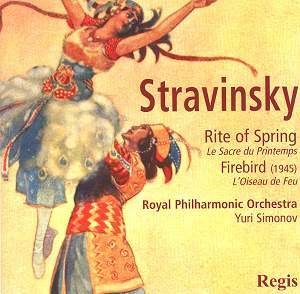 As for the recording of Stravinsky’s L’Oiseau de Feu – The Firebird, I find much to admire here, especially its pairing with The Rite of Spring instead of Petroushka. Both have hints of Russian Orientalism and both have an elegance of style and mood that, for me, have always made them my favorites of the composer’s three great ballets. That aside, this version of The Firebird (the 1945 suite) has all the lushness and melancholy you expect if you’re familiar with the work but Maestro Simonov chooses to operate at a much slower pacing than other conductors. He brings The Firebird in at 31 minutes and the common timing for this version of The Firebird ranges from a brisk 22 minutes to about 28 minutes. The full performance version (1919) comes in roughly around 45 minutes. So this “suite” is closer to the full performance versions available. Simonov infuses the right amount of dynamism where it matters, but in the more delicate passages — such as the Pas de Deux [tr. 19] the work slows and loses both momentum and tension. As I said, the score gets up and running in the correct places, I just wished for a more cadenced performance. But, boy, the physical sound is absolutely gorgeous and the players themselves are spot-on. The college professor in me - and I tend to be a softie - would give this disc an A- for both sound and performance; but these are two of my very favorite works. I nevertheless look forward to hearing more from both this conductor and this label.